Bring and distribute 10 bags of clothes and shoes…including soccer gear. Visit the Teso ministry in Torroro, upgrade audio and video capabilities and encourage their training and evangelism efforts. Here are a few project photos….. Here are a few favorite photos…. Last September MSM began funding a four room expansion of the classroom building at Promise Primary School serving the Nabwigulu community about 15 km from the CRM Home. The expansion was needed to add the 6th and 7th grade classes and allow more children to register. A fresh water well was dug and installed to serve the school in October. During this trip a school necessity was installed….a playground! …. and rain gutters and 60 desks and 6 tables. Promise Primary had 225 students last year and has opened the 2019 school year with 400 students registered. Many of the additional 175 kids had not been attending school or were in poor learning situations. The goal is to expand registration by another 50 students eventually, including families that can not pay the modest tuition as sponsorship funding is available. The vision is to impact the community in a long term way….education. Finished building….added rain gutters for the rainy season. I love this Place! Less than a week before returning home. 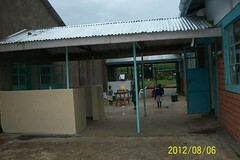 All of our planned projects at Child Redeemed Mission Home will be completed in a few days. The grade school and upper class High School kids start school Monday and everyone is prepared. 7 new High Schoolers are being prepared to start in a week. The playground, student and teacher desks, and building projects for Promise Primary are finished and they are ready to start school Monday. The church is really alive and service is tomorrow. Please pray for all that to go well in the next few days. I’m enjoying everyone. I love this place….. It was built on prayer over the last 5 years. Thank you for being part of it. Final update from Kenya, from Tony…. Thursday evening, we had a nice time sharing and getting to know the staff better. We were wishing we had done this earlier in the week but it was great to get to know a little bit about them. Friday morning Bobby, Charlie and Ed went into town to get a new generator to replace the existing one which could not handle the load of the well pump. They purchased a nice generator and put it right to work filling the tanks when they got back. Now the facilities will have water even when Kenya Power is out for extended periods. We did a lot of tidying up around and put the repaired tanks all back in place. We caulked and patched the few remaining gutters that needed repair and hooked them back up to the tanks for water collection. The home now has a more than sufficient amount of water storage available to handle extended dry periods without power. Ed took the time to show several local pastors how to fit and distribute reading glasses. This was a need pastors had indicated would really help their members in Bible reading and study. We took time to play with the kids and visit with sponsored children. The children at the school gathered together and sang several songs. There were probably about 100 kids and that was a real joy. As the evening wore on we received numerous notes from the kids thanking us for the work we had done and imploring us to come back again. The joy in their hearts is really a blessing. We should learn to be so thankful for all the Lord as given us. Quilts made by the ladies in the Quilting ministry at our church were handed out and appreciated. Dad did some additional carpentry repairs and built a few boxes to store tools in. They were inventoried and stored so we know what will be available when we return. We had a wonderful meeting with several local pastors in the evening. We spent a couple of hours discussing their needs and then shared a meal together. It is very clear that the church in the area is desperately seeking teachers to train and teach their church leaders. Although discussions of improving facilities was discussed briefly, the overwhelming request of all the pastor there is that the church in the US send people who can train local church leaders. There is a passion to learn the word of God in these men that I only wish I could emulate. We will begin to see if there is a way we can meet this need going forward in some way. Saturday morning, we caught the flight out of Kitale to Nairobi and will spend the day here in the Hampton House. We will leave tonight and be home Sunday morning. It has been a wonderful trip and as usual we leave feeling blessed. Thank you for your support.